Fig. to understand someone or something that someone has said. (Usually with the negative.) I can’t make heads ortails of Fred. No one can make heads or tails of this problem. Heinze often has quite brilliant ideas, but sometimes they are a little bit too complex to explain to others right out of the blue. 😉 This one is rather simple if you have basic knowledge of binary numbers, but else… well, it can be rather difficult. Do you know any game mechanics that might be a little too complex? That mechanic is GENUIS!!! Heinze, let’s design an boardgame of EPIC proportions built around this! 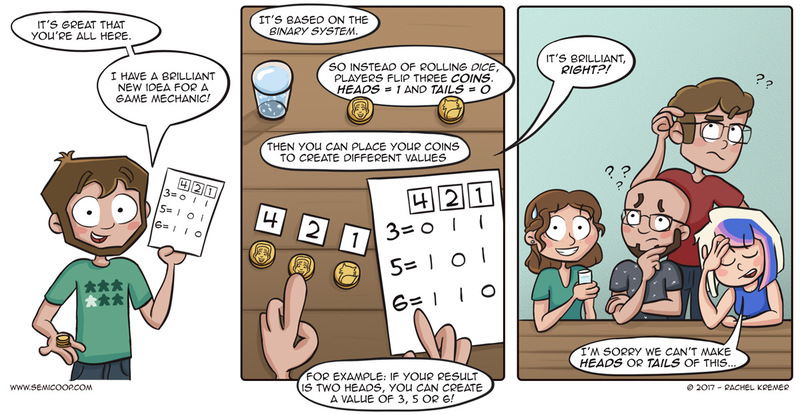 We could also use three sided dice with number 1, 2 and 4 for our boardgmae, because any good boardgame needs dice. Just think a bit about a 3-sided die and how that would look/work… Or rather, how it wouldn’t! You could use two sides each of a 6-sided die… But then if you’re doing all of that, you might as well use an 8-sided die with numbers 0-7 and save yourself a lot of coin tossing and dice rolling! most ppl should understand it. Still I don’t see much use for this mechanic. I think there are many badly presented mechanics. Like above, you an explain so ppl will understand or explain so even when you knot the rule you don’t get what are some explanations trying to do. Like Kanagawa rulebook. I couln’t make a worse explanation of Coloretto draft mechanic even if i tried. And game has many extra elements that additionally obfuscate poor explanation of basic mechanic. Making main mechanic – relatively simple take or wait for more choice – next to impossible to understand, after reading rules for the first time.